Once upon a time Beatrix Potter wrote a story about a naughty rabbit named Peter. Far away in Japan, he was so popular people flew half way around the world to buy key rings with his picture on. But why? The huddle of Japanese tourists appears from nowhere and waits patiently. They have come from Osaka and Tokyo to a small tourist attraction in the Lake District dedicated to this famous rabbit and his friends. It is Peter - and the shop - they want and I am delaying them by asking them why. But they smile and, via interpreter and tour guide Akiko Wada, politely offer shy descriptions of life-long adoration. Many, like Kazuko Kobayashi, read it in English as a child at school and now share it with their grandchildren. Peter Rabbit in a bank? Peter Rabbit can be spotted in the most surprising places in Japan - including otherwise formal financial institutions. Mitsubishi UFJ Trust and Banking in Tokyo has used the character as a mascot for 25 years and is celebrating the anniversary with a series of 25 Peter Rabbit gardens in its branches. It has also produced a 10m-high mural depicting characters from the books. On a trade mission to Japan to meet tour operators and businesses, World of Beatrix Potter chief executive Andy Poole saw the tribute first hand. "It all looks rather surreal and very out of place but, for someone like me whose working life is spent immersed in all things Potter, it was absolutely fascinating," he says. With a wry smile, her husband Iichi Kobayashi says he is here because she brought him. But he is still buying presents and admits the "impressive story" is very popular at home. Perhaps unfortunately for Mrs Tiggy-Winkle, Squirrel Nutkin and the rest of Peter Rabbit's cohort, the Japanese are only really interested in the bunny. Those at the World of Beatrix Potter are ready to buy anything with his image. They move round the displays in no time - considering how far they have come to see them - and descend on the shop. Deputy manager Stacey McShane is used to this speed. "They want to shop as soon as they come in. They go straight into the attraction and they're in and out, they go round the garden, take their pictures of all the characters as quickly as they can and then, once they're in the shop, it's whatever they can buy with Peter Rabbit on. "It's all little magnets or mirrors or pocket books that they can write in. They always buy about 20 of each - once one buys one, they all buy the same." Size is an issue - the smaller and sturdier the trinket the better it fits in a suitcase. Mrs McShane believes if they did not have to transport their purchases back to Japan "they would buy the shop out, they would buy everything". And they already buy a lot, she says. In groups, they are the attraction's best customers "by far". Three days a week, every week, right through the season. They are "very, very" polite and inclined to make "little origami things" for shop staff while they wait to pay. The attraction does not take the interest for granted, however, and managers make trips to Japan every few years to meet tour operators face to face and make sure Peter Rabbit stays on their itineraries. The chief executive of the attraction is on a trade mission in Tokyo to encourage even more Japanese tourists to visit the Lake District. "It might seem odd to be travelling 6,000 miles to a very different culture in order to promote my business," Andy Poole says. "Japan, however, is unlike any other of our overseas markets in that it has a huge affinity with one of Miss Potter's characters in particular, Peter Rabbit. "We welcome some 15,000 visitors from Japan every year, so for us it is very big business." This tour is small by usual standards - only about 10 when 30 or more is not unknown - but it fills the little gift shop. Fujiko Miyazawa is adding to her collection of Peter Rabbit dishes, cups, and "so many pretty things". She is well travelled but has always "longed" to make the trip here, even though supply is plentiful back home. The Japanese passion for all things Peter Rabbit extends to themed shops, restaurants and hotels. There is a replica of Beatrix Potter's house Hill Top, a theme park and a series of Mr McGregor's gardens in one of the country's largest banks. Requests to use the name are sanctioned - or not - through a complicated chain of command that stems down from publishers Frederick Warne via Silvergate Media, who are responsible for global merchandising, and their agent in Japan, Sony Creative Products. Their figures suggest 80% of the population have heard of Peter Rabbit - but why are people interested? What is it about a 120-year-old disobedient animal that has them flocking? Makiko Tanaka, from Sony's content marketing department, says rabbits are very popular in Japan - after bears - because they are "small, fluffy and cute". This particular rabbit taps "a certain admiration or yearning for European culture which is very different from ours". Potter's "British cynicism" or "British way of thinking" is also attractive, she says, especially to the young. "People here think it's mean to refer to Peter's father by a pie, though it came from the original book. I understand it's a sort of euphemism to tell Peter not to go to Mr McGregor's garden, but it's a shock for some Japanese especially who do know Peter Rabbit as a cute character, but do not know the story." Yuriko Allen, a Japanese woman who now lives in Gateshead, says the character is "really famous for baby goods" but also acceptable for adults. 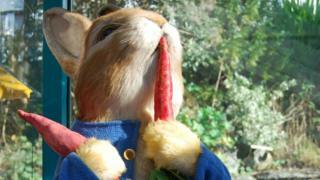 She says Peter Rabbit's combination of being "cute" and at the same time not entirely childish is appealing. In a world where many characters aimed at children are bright to the point of garish, she is not the only one to mention the draw of the soft, subtle colours. A Japanese travel operator, Kimoko Ikegami, sums it up like this: "Peter Rabbit is so cute, but he also is very British and people in Japan admire both of those qualities. The books were translated into Japanese 40 years ago and were an instant hit with children of that generation. We have read them ever since." So, Peter Rabbit is cute, British, natural, pastel-coloured, cynical and a guaranteed draw. But his uses are not limited to key rings, toys and a name that will bring in customers. In June 2006 a replica of Potter's house, Hill Top Farm, was recreated, brick-for brick, in Saitama Children's Zoo, an hour from Tokyo. It is "remarkably similar" to the original, says George Wallace, who helps run it. He is associate professor of English and American Literature at nearby Daito Bunka University, which built the replica to house its Beatrix Potter reference library. "On the inside, however, it is a modern museum, built to withstand earthquakes - fingers crossed. We have tried to give the interior an English feel by using materials brought over from the UK, for example the slate floor, the wallpaper, the wooden staircase," he says. "At first I found the popularity of Peter Rabbit rather bizarre. His face appears on all manner of things, often on plates for some reason." But now, 25 years after moving to Japan, the obsession is "just part of the fabric of my everyday life". Meanwhile, in Tokyo, Shino Morishige, who runs Peter Rabbit Flowers, is pleased she went to the trouble of seeking official approval to use the name for her florist shop. It is one up on the other shops and, after all, he is the "most famous rabbit in the world".